Sarah & Michael Wiener: Trousseau was created in 1999 as a 1,500 square foot destination location bridal accessories store with a lingerie add-on, designed to expand and maintain sales volume during seasonal trending. To be convenient to Northern Virginia, Washington DC and Southern Maryland; the Trousseau location is situated at the nexus of six major travel routes, with convenient parking and forty plus feet of solid window frontage. Near three bridal shops, Trousseau quickly gathered success in the bridal arena. As the demand for quality lingerie and bra fitting services increased due to a void for the product in the general area, Trousseau evolved and in 2007, expanded to 3,000 square feet with 8 dressing rooms. Trousseau presents the individual experience of an independent shop with the polish of a chain store. With a comfortable living room feel, Trousseau offers lingerie, foundations, sleepwear, hosiery, bath and body products, costume jewelry and bridal accessories. As we are attuned to the American style of shopping, all product is attractively displayed on the sales floor with very little back stock. Sarah & Michael: Trousseau is a solution based, visually dynamic, service oriented lingerie store with significant depth and breadth of inventory, stocking over 160 bra sizes with more than 4,500 bras on the floor at any one time and complimentary alterations. Our mission is to solve problems and make women feel more confident, comfortable and beautiful. The lingerie industry is about intimate relationships. In recognition of the importance of those personal relationships, our staff is diverse and empathetic, compassionate and caring with a sense of humor. We place great value on product knowledge, perpetual education and training, both in house and with our vendors. In November of 2010, Trousseau experienced 100% smoke damage loss due to a fire in our shopping center. Completely restocking the store after the fire, on a four-week timeline with ten years of product knowledge and product development, fine-tuned both our vendor relationships and the solution based product offering of Trousseau. Sarah & Michael: With regard to selecting product, we require quality, fit, style, value and size range. Turning over $800 per square foot, our sales floor real estate is precious. Product offerings must make sense. At Trousseau, we all work as a team in order to provide great service. We consider our vendors to be an extension of our team. We place great value on these relationships. A vendor must be reliable, consistent, responsive and committed, with a demonstrated history of smooth supply chain to independents in order for our team to properly service our clientele. With today’s global market, we understand that some supply chain issues are inevitable. How a vendor helps us to work through their issues can make the difference between maintaining or compromising our customer relationships. Today’s retail customer demands instant satisfaction. Most will tolerate a delay if they are given a realistic idea of what to expect. Accurate and timely communication is vital. We can’t work with information that we don’t have. Strong vendor personal presence with the staff equates to strong vendor representation on the sales floor. To their credit, Chantelle and Empriente have created a particularly synergistic relationship with Trousseau through their dedication and support. As more and more women become educated and begin to wear the correct bra size and appreciate quality product, enlightened manufacturers are listening and responding with greater options. We are excited and gratified to see great product evolution based on vendor/client interaction and collaboration. Sarah & Michael: Drawing a large part of its population from Government, Military and Technology Industries, the Washington DC metro area is not particularly trendy. Inspired basics and more classically beautiful pieces define the larger body of our collection. Sarah & Michael: Our price range is moderate to luxury. Our size range is 28AA to 56N, XS to 3X. Our client base exceeding 50,000 is diverse and mutigenerational, from preteen to senior citizens with a concentration in the 30 to 50 year old age range. Our top 10 bra sizes include: 32F, 32E, 34F, 34E, 36F, 36E, 32D, 34D, 34G & 32G. Sarah & Michael: As we strive to create long-term relationships with our customers, and appreciate their referrals, we encourage our customers to spend what is right for them. Sarah & Michael Wiener: Located in what may well be the strongest local economy in the United States due to the Government, Military and Technology Industries, Trousseau achieved 9% growth last year, selling 20,665 bras and bustiers in 2013, accounting for approximately half of our annual revenue. 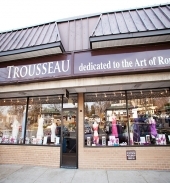 Trousseau is a single location brick and mortar store. Although we ship worldwide to service our clientele, we do not sell online, and we do not have sales. We recognize that today’s consumer can be demanding, morally flexible and unforgiving with the Internet and Yelp! at their fingertips. Celebrating our 15th anniversary in September, we know that we make or break our reputation every moment, of every day, with every customer that walks in the door. So we accept life on stage, strive to consistently give our best service, and take great pride in the difference we make in people’s lives everyday.